My wife needed a cabinet to store her school books, and I wanted to attempt to build a piece of actual furniture. 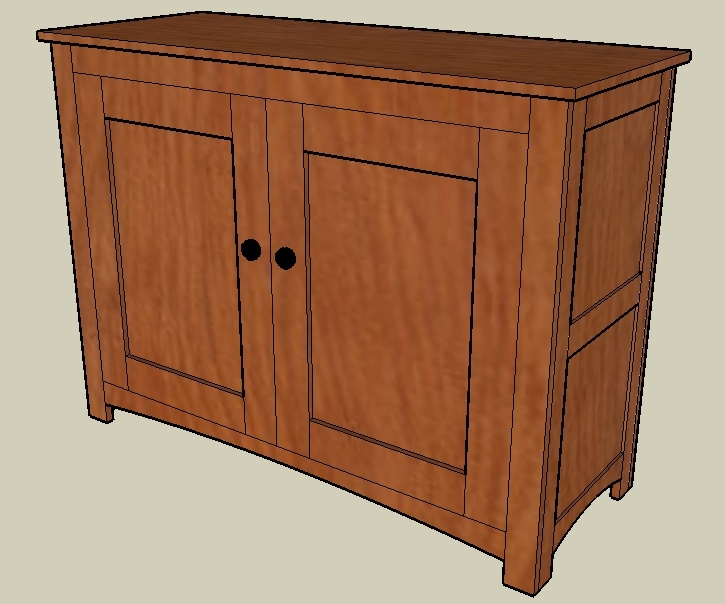 I'm calling this a shaker style cabinet, although it may not be in the true shaker style, it has a lot of shaker style elements. I'm using red oak stock for everything, and quarter inch red oak plywood for all of the panels. I started by building the sides of the cabinet. Each side has 3 stiles and 2 rails routed with a quarter inch router bit. The flat panels are quarter inch oak plywood. The bottom stile arc is cut using a bandsaw. I used a piece of plastic that bends to create the arc line and sanded the arc smooth. Here is one of the sides fully assembled. Here are two sides. I accidentally used the wrong plywood in my first attempt. It is quarter inch birch plywood, so I redid it, and the first one will just sit in my shop as a sample. I no longer have to use a circular saw for all my cuts. Here's my new Dewalt DW716 Mitre Saw. The bandsaw in the back is borrowed from my father in law. Here are all of the rails and stiles cut for the back of the cabinet. I assembled one side of the back of the cabinet first, then the second one. I really need an assembly table. Here is the front of the cabinet so far. The sides are not attached yet, just clamped in place. Here is the back of the cabinet so far. The main part of the cabinet with the oak plywood bottom in place. Fitting the rails for the doors. An assembled door, you'll notice I stained the shelf to see how it would look. We thought long and hard about stain vs paint, and since red oak brings the grains of the wood out very dark, we decided to go with paint. The cabinet with the doors fitted. A fine door joint if I do say so myself. A more artistic view of the door joint. The doors in place and ready for hinges. We decided to go with an antique look and wanted the hingest fully exposed on the outside of the cabinet so my wife found some online that we ordered. Our kitchen is a light yellow color and the joining room is a dark brown. We decided to paint it the same color as the kitchen and place it in the dark brown room to give it a nice contrast. I used 2 pieces of oak for the top rather than one large piece to remain cost effective. I routed the edges as you can see. Mostly painted, with the hinges in place. Here is the finished product. It was a bit taller than I imagined in my head but gives my wife plenty of storage space for her school books. I think the color goes well in the dark brown room.